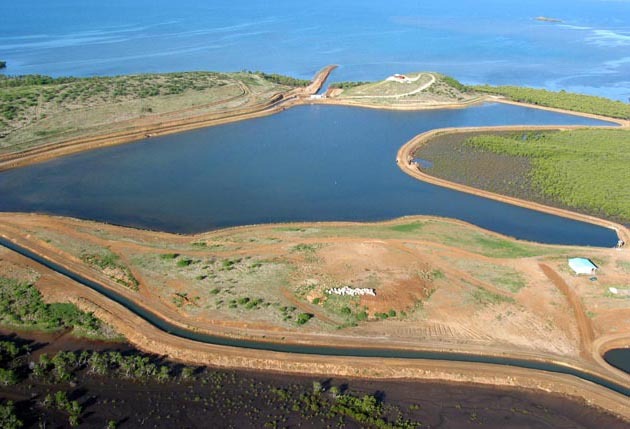 The low density of inhabitants in the breeding basins (less than 400 grams per cubic liter of water, or five times lower than in main producing countries) coupled with nearly natural farming techniques is a guarantee of impeccable original quality for New Caledonian shrimps. Nurtured in basins built in natural beds and filled with water from the lagoons, the shrimps are taken very good care of at each stage of their production, in conformity with the principle of moderate and natural growth. Harvest takes place from mid-December to mid-August according to seeding periods, preferably during nighttime in order to avoid disruption to the animals. Originating in the Pacific coast of Latin America, western blue shrimp (Litopenaeus Stylirostris) is a rare species that has not yet been well exploited in aquaculture. 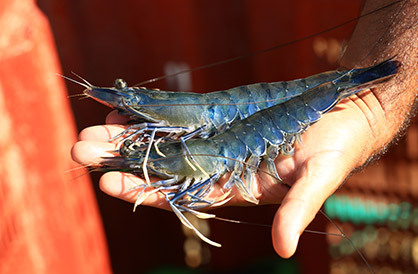 As blue shrimp adapts perfectly to the climate of New Caledonia, its organoleptic and nutritional qualities are furthered in the Oceanian environment. Its sensory properties are unmatched, thanks especially to the amino acids to which it owes its softness and sweet taste, both of which are highly appreciated by culinary experts. On top of this exquisite taste is its superb blue color, presumably attributable to its 100% natural food supply from the planktonic lagoons of New Caledonia.